There were many attempts at regionalization of climate of Northern Eurasia. The early schemes were based on those individual meteorological variables that control natural vegetation. Thus in the 1920s, Kaminsky used temperature and humidity as a basis for regional division while in the 1930s Voznesensky produced a model based on the principles of Koppen (Borisov, 1965). Later climatic regionalizations were based on generic criteria. Alisov (1956) produced a model based on radiation regime and atmospheric circulation, drawing climatic boundaries in agreement with the distribution of soil and vegetation cover. This model, which has been widely accepted, distinguishes four climatic zones: arctic, subarctic, temperate, and subtropical. 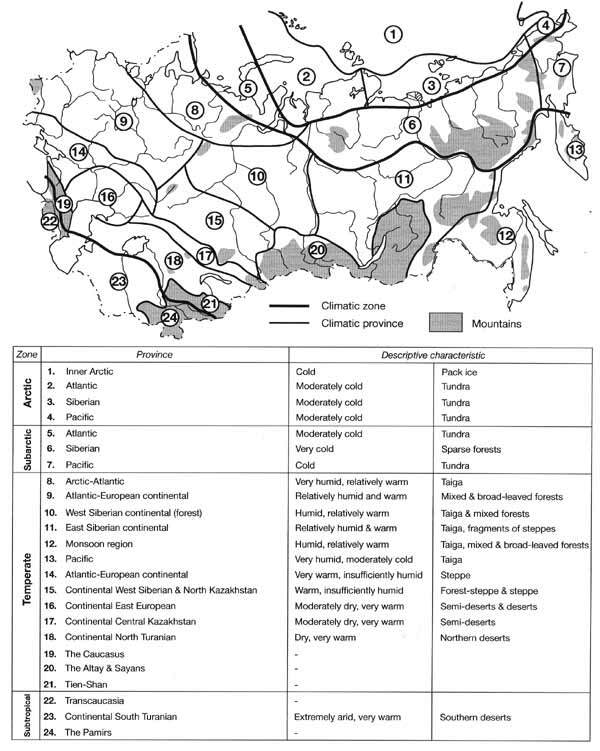 These are further subdivided into climatic provinces (Figure 3.3). The most important criterion in Alisov's scheme is the prevalence of different air masses. For example, the northern boundary of the subtropical zone is determined by the average winter position of the Asiatic branch of the Polar front while the northern boundary of the temperate zone is determined by the average winter position of the Arctic front. The soil and vegetation zones are used as a general background to the climatic scheme. Each zone and many provinces accommodate mountainous regions and local and even macroclimatic effects of the mountains are not incorporated into the scheme. The two most important features of the air mass climatology of Northern Eurasia is the transformation of air masses from temperate maritime and arctic maritime into temperate continental over the vast land mass and seasonal reversal of the characteristics of temperate continental air. Temperate continental air dominates Northern Eurasia throughout the year. Its frequency varies from 35 per cent in the Baltic region to 65 per cent in Siberia and Kazakhstan (Borisov, 1965). In winter, snow cover plays the main part in the process of transformation. First, snow cover increases reflectivity of the Earth's surface. Albedo changes from 20-30 per cent in July to 60 per cent and 70 per cent north of 50°N in the European territory and Asiatic part respectively, enhancing the seasonal decrease in net radiation (Lydolf, 1977). Second, snow cover inhibits heat flow from the ground. The insulating capacity of snow is important for agriculture: many crops are sown in autumn in order to make full use of the short vegetative season. Third, snow pack looses heat rapidly. Although the outgoing long-wave radiation is low (because of the low temperature of the snow pack), most of it is lost to space under the dry, clear sky conditions whereby there is very little counter-radiation. As a result, a low surface air temperature develops, enhancing the development of high pressure. Calm, clear weather, associated with high pressure, in turn further enhances the loss of heat through this classic positive feedback mechanism which is aided by suppressed turbulence. In January, almost all of Northern Eurasia (apart from the southernmost European territory, Central Asia and Kazakhstan which do not have a stable snow cover), has a negative radiation budget. In summer, the opposite occurs: solar heating of the ground allows for the absorbed energy to be returned to the atmosphere as terrestrial radiation and promotes turbulent heat and moisture exchanges. In winter, temperate maritime air is of Atlantic origin (Figure 3.4). It is the main warm and humid air mass for Northern Eurasia at this time of year. Associated with it is cloudy weather that prevents rapid loss of heat and slows the transformation process. On average, the transformation of temperate maritime air occurs by the time it reaches the Ural mountains. However, when depressions transporting the Atlantic air take southerly tracks, maritime air remains distinguishable as far as Lake Baikal. Temperate air of Pacific origin has little influence because of the winter monsoon, affecting only the coastal regions and the islands of the Russian Pacific and occasionally the Chukchi peninsula. Arctic maritime air originates over the Barents and Norwegian Seas and affects mainly the European part of the region. Siberia and the European north-east are affected by arctic continental air which forms over the frozen Siberian seas. Temperate continental air is generally cold and dry although both temperature and humidity vary between different parts of the region declining landwards. In Eastern Siberia, where radiative cooling is extreme, temperate continental air is colder than the arctic air and, paradoxically, the advection from the frozen Arctic Ocean causes temporary temperature increase. Winter precipitation is associated with frontal activity and forms in maritime air masses. In summer, temperate continental air is also formed of temperate maritime and arctic maritime air but their sources, geographical extent and characteristics are different. Temperate maritime air is of the Atlantic origin in the west and the Pacific in the east. It is cool and humid especially in the northern part of the Russian Pacific where cloudy and foggy weather is associated with it. Arctic maritime air forms over the open water between the Arctic coast in the south and pack ice in the north. It affects the northern part of Eurasia from the Kola peninsula to the Bering Strait, being most frequent in spring and early summer. Fresh arctic air masses are cold and have low moisture contents. Without frequent advection from the north, temperatures would have been 4-7°C higher in the tundra zone and 1-3°C in central East European and West Siberian plains (Zhakov, 1969). The thermal regime of the East Siberian tundra is affected by arctic air particularly strongly because it arrives from the colder seas. However, in the process of transformation over the continent, arctic maritime air masses gain moisture through evaporation enhanced by forests, at the same time becoming less saturated as their temperature increases. The resulting temperate continental air is warm but its humidity varies. While in the northern part of Eurasia it is relatively humid, prolonged transformation over the forest-steppe, steppe, and semi-desert zones results in the loss of moisture and very low humidity. In summer, precipitation develops in both maritime and continental air masses and is of both frontal and convective (air mass) origin. The southern part of the region, including the southern European territory, Caucasus and Transcaucasia, Central Asia, and the Maritime Province, are influenced by tropical air. 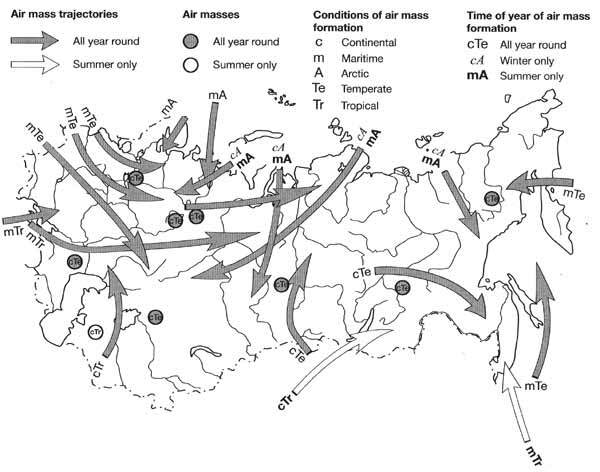 Tropical air masses enter Northern Eurasia from the Mediterranean, Middle East, Asia Minor, China, and the Pacific and in summer, they also form over the deserts of Central Asia and Kazakhstan (Figure 3.4). Tropical maritime air reaches the European territory and western Transcaucasia via the Mediterranean and the Black Sea throughout the year in the warm sector of depressions developing on the Polar front. Although these air masses reach Northern Eurasia having been already considerably modified, they still have a very distinct character. Its main characteristics are high temperature, high humidity, and strong instability (although in comparison with other parts of the world, these characteristics are less pronounced as the passage of the Mediterranean air masses over the warm sea surface is limited). Tropical maritime air maintains mild winters in western Transcaucasia. Associated with these air masses are strong precipitation and winter thaws. Even in January, the arrival of tropical maritime air to the southern European territory, which occurs on average 6-8 times per winter, brings about temperature increase to 5-7°C and snow melt (Klimenko, 1994a). Although tropical maritime air masses affect primarily the European south, they can reach as far north-east as the Ob estuary. Tropical continental air mainly affects Transcaucasia and Central Asia, arriving from the Middle East, Iran, and Afghanistan. While Central Asia experiences tropical continental air masses throughout the year, the European south is affected in summer and autumn. In the southern Ukraine, tropical continental air occurs 9 per cent of the time and occasionally it may advance to the European north (Borisov, 1965). In summer, the deserts of the Turanian lowland receive very high insolation of over 20 kcal cm-2 per month. About 70 per cent of net radiation is used for sensible heat exchange, raising mean monthly temperatures to 30°C. In this region, continental temperate air is transformed into tropical continental air. The frequency of this air mass peaks on the Turanian lowland, reaching 28 per cent (Borisov, 1965). Another region, affected by tropical air, is the southern part of the Far East. Tropical air masses arrive to the Far East only in summer, mainly as tropical maritime air from the western Pacific. It is the main source of precipitation, providing about 70 per cent of the annual total (Myachkova, 1983). Tropical continental air, which also affects southern Transbaikalia, arrives from Mongolia and central China. The main characteristics of these air masses are high temperature and very low humidity.